In Nutricion24 already have at your disposal Rice Meal 375 gr., A product of Vit. O. Best, they are grain rice as small hoops that you provide sustained energy so you have strength for longer. Rice Meal Vit 375 gr. O. Best is a food that has been manufactured with organic rice, has a high value in vitamins, especially those of type B. Type B vitamins are good for protein synthesis and is ideal for all types of athletes. It is a natural product that has no added sugar artificially, and no salt. 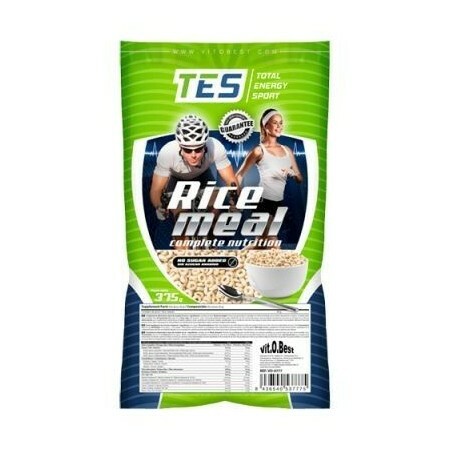 Rice Meal Vit 375 gr. Best O. contains no fat, no cholesterol, also do not contain gluten. These rice grains, are high in vitamin C, which helps us to strengthen the defenses and is very beneficial in preventing colds. It also contains a lot of potassium which together with its low sodium content makes us help eliminate body fluids and also avoid cramps during long workouts. It has no added sugar. It has a high iron content does help us to avoid iron deficiency anemia. Has lots of vitamin A, cereals made from rice, help us prevent eye diseases, strengthen the immune system. Because of its high content of vitamin A Rice Meal, it favors the state of the skin and mucous membranes. Rice meal is high in Vitamin B1, helping us to overcome stress. Foods containing Vitamin B1 are recommended during periods of pregnancy and lactation. They are also rich in vitamin B2, these can help us if we have migraines, they are useful for insomnia, anxiety or stress. The rice-based cereals also contain vitamin B3, the vitaina B3 helps reduce cholesterol, it is advisable to fight diseases such as diabetes, arthritis. It contains Vitamin B6, a vitamin that helps prevent heart disease, reduce carpal tunnel symptoms. It contains folic acid or vitamin B9, these causes consumption is healthy in stages of pregnancy and lactation. Contains Vitamin C, this makes the rice cereal consumption is beneficial to the skin, the respiratory tract. In addition to reducing cold symptoms. It is also good for constipation. Its content of potassium and low sodium levels help to eliminate fluid.